W fenders are made for the most extreme operating conditions. It has a unique open bore design which makes installation very simple. The flexible legs allow W-fenders to be curved around most hull shapes. ... or steel angle. Weldless steel rings are installed among the treads at strategic points throughout the fender, which are then used to secure the fender to the boat hull. 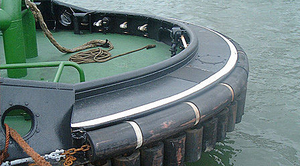 A tugboat fender, usually of rubber, absorbs the shock of impacts and pressure while the tug is maneuvering a ship. NauticExpo offers a variety of fenders categorized by shape including M-shaped, W-shaped and cylindrical models. These devices are designed to absorb impact and improve grip when pushing. All tugboat types, whether oceangoing, harbor or icebreakers, carry fenders. Cylindrical versions are used when pushing against the sides of a ship. M-shaped fenders offer improved purchase on a ship's side, while W-shaped models adapt well to the shape of the tug. Most fenders are made of rubber and similar elastic materials. Choice depends on the anticipated function of the fender.